David and I watched a documentary by Jonathan Walker called “Fairy Faith” on the Sundance Channel last night. Walker interviews people in Nova Scotia, England, Scotland, and Ireland who believe in the fairy realm and/or who believe they have had experiences with fairies. The film also includes discussion of fairy lore and how the fairy image changed—became nicer—to suit Victorian times. One, among many, interesting ideas the film presents is that of alien sightings being modern day replacements for superstitions that used to center on the fairy realm. 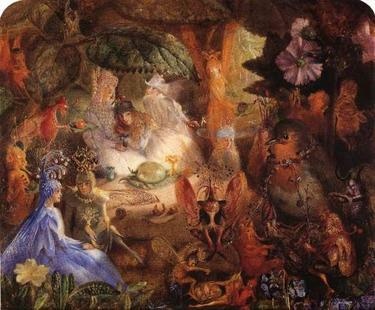 Some fairy paintings by John Anster Fitzgerald were shown in the film. Above is one called “The Captive Robin.” I got the image from a great site called ArtMagick, which focuses mainly on paintings that have literary and mythological subject matter. You can read about this painting here. I caught the last twenty minutes of this film and found it very interesting. If you wish to learn more on this subject, the works of R. J. Stewart might interest you. He also has a websight, www.dreampower.com. I saw the tail end of it on the Sundance channel too. I was really impress. I have had many exsperiances with the fey, and I am happy to see this film. I do just wish though they would show the film again so that I can see it all the way through.